A former school built in 1903, today Columbus Court is a residential condo conversion located in the historic North End. The building houses 34 luxury condominiums featuring 13 ft ceilings, 10 ft windows, hardwood floors, French doors with Juliette balconies, marble bathrooms, fireplace, granite counters with gas cooking, walk-in closets and a storage room. There is 24 hour concierge, elevator, gated courtyard and deeded garage parking. Exceptional views of the Harbor, and city skyline from the common roof deck. There is plenty of choices of Italian fine-dining, boutiques, just a short walk to Waterfront Parks, Downtown Boston, Financial District. This is a pet-friendly establishment upon approval. 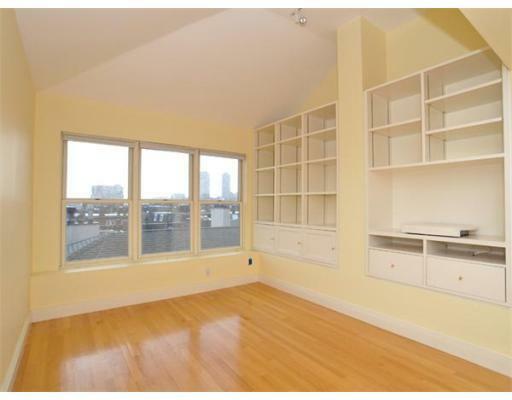 Contact us for more information on these Columbus Court condos in Boston MA. Impeccably renovated two bedroom home located at the prestigious Columbus Court. This stunning south-facing home features an assigned parking space, soaring ceilings and custom craftsmanship. The home has been meticulously cared for and features two large bedrooms with two full baths. The large entertaining sized living room has custom built-ins, floor to ceiling windows and two Juliette balconies. Other highlights include washer/dryer, central air conditioning and gas cooking. This property is available fully-furnished. Columbus Court features on-site parking, concierge, elevator and an expansive roof deck with breathtaking views of the North End. Located in the heart of the North End this dynamic location is steps to the Waterfront, Financial District and all major points of transportation.